Well we think these owl necklaces are darn cute! These owl beads are made of Lucite and have been imported from Western Germany. 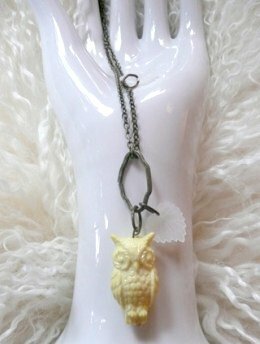 The vintage pale yellow owl measures 1.25" long, lucite leaves are .75" on a 1" brass ring. One leaf is placed on a jump ring up the chain to add an asymmetrical look. Brass chain is 20" long. The collection of lucite vintage owl beads have been imported from Germany. 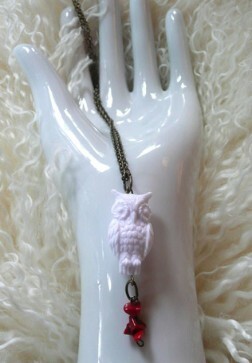 The vintage white owl measures 1.25" long and has red coral beads. The chain is antique brass and is 22" long. The collection of lucite vintage owl beads have been imported from Germany. 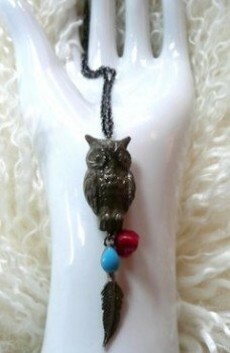 The vintage olive green owl measures 1.25" long, feather detail measures 1.5" long on an onyx metal chain 22" long. The collection of lucite vintage owl beads have been imported from Germany. 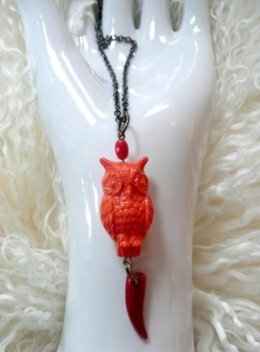 The vintage orange owl measures 1.25" long and has a red resin tooth detail that is 1". Rings are antique brass and chain is onyx. Chain is 22" long. The collection of lucite vintage owl beads have been imported from Germany.